ANECDOTES FROM THE HISTORY OF TOGAKURE-RYŪ . . . In the carnage and bloodshed of the Sengoku era of Japanese history, there lived three brothers, Takao, Seikō and Kirin, renowned masters of the Togakure-ryū method of combat, assassination, and infiltration, whose exploits are recorded in the surviving chronicles passed down in the modern day to Dr. Masaaki Hatsumi. They were the three men called upon by warlords when an operation was deemed either nearly impossible or considered a suicide mission. All three men were considered geniuses of combat with the rare and innate ability of ‘sui-eishin’ (水影心); the capacity to observe a movement within the chaos of battle, copy it, and improve upon it. It was this ability that made the men of Togakure-ryū infamous throughout the neighboring provinces with stories carried in whispers amongst the local populace. In 1480, Takayori Rokkaku (六角 高頼) sent the vicious assassin Saburo Mochizuki to kill Seikō to avenge the deaths of several close clan members at the hands of Seikō during the Onin War. Feared for his deadly skill with the long sword, Saburo was also known for his unusual height, strength, and speed of movement in battle. Aware of Saburo’s dispatch by Takayori by local operatives, Seikō left his residence and moved quickly to meet the deadly assassin at the border that straddled Ōmi and Iga provinces. When the two assassins met on the lone border road, Saburo drew his sword and stalked Seikō, who mirrored his enemy’s moves with a slight smile. The two men sized each other up in a glance, after which Saburo attacked ferociously, slashing in while moving with lighting-quick dexterity, his distance and guard morphing continuously. Aware that he could not beat Saburo if he played into his tactics of constant movement, Seikō adopted a focus of ‘sutemi’. Lowering his guard while slowing his own mirrored movement, Seikō suddenly gave the impression of losing stamina. At that moment, Saburo closed in for the kill. In an instant, Seikō pinned Saburo’s foot to the ground with his own foot to stop Saburo’s movement. Then, in a flash, he thrust his katana through both his and Saburo’s foot, pinning his enemy to him. Saburo shrieked in pain, losing his focus on the kill. In the seconds that followed, Seikō, his mind pushing through the pain, took advantage of the fleeting opening, stabbing Saburo through the neck with a hidden ‘tanto’ (knife). Then, withdrawing the katana from their feet, Seikō then took his head. Unable to walk well for years, Seikō and his brothers, nevertheless, did not have any further attempts made on their lives by the Rokkaku clan. When Seikō had a young operative secretly deliver Saburo’s head to the entrance to Takayori’s residence, there was a note included that read ‘next time, it will be your head’. Daimyo, despite their power, drew a good measure of caution In years that followed, whenever the name of Togakure-ryū was mentioned. For they were the men that could not be stopped. The men who could breach any stronghold. The men who could reach any warlord, no matter how well-protected. They were ‘kanja no mono’, the men in between things . . . The term ‘battô-jutsu’ (抜刀術), or ‘nukutô no jutsu’, literally translated as ‘the art to extract the blade’, indicates the practice which consists of drawing the sword and to cross, avoid, or strike, all within in a single movement, without the enemy being able to see or feel one’s initial intention. Relations between the various traditions of battô-jutsu and the first three sword traditions of Japan (Nen-ryû, Kage-ryû, & Kashima-ryû), postulate that this art existed already within these three founding sword schools. Many chronicles describe such sword luminaries as Bizen No kami, Bokuden, Hidetsuna, & Muneyoshi, as well as their disciples, as excelling in the art of iaijutsu. However, the techniques were a collection of various and often vague principles for using the body that led to a freedom of interpretation. The first tradition which did specialize and codify this art into a precise methodology was founded by Hayashizaki Jinsuke (1542 -?) at the beginning of the Edo period. Hayashizaki transmitted his method to only three disciples. One would go on to become his successor and the other two would eventually found their own traditions. During second half of the Edo period, the schools resulting from Hayashizaki-ryû used the term of ‘iai’ (居合), rather than the term of ‘battô-jutsu’. There exists a score of terms which all are read as ‘Iai’, but are translated broadly as the action of ‘engaging and fighting an approaching enemy’. ‘Iai’ means ‘to link’ and ‘to be’, which can therefore be translated as ‘linking the intention and the movement in a moment when the technique must be carried out’. 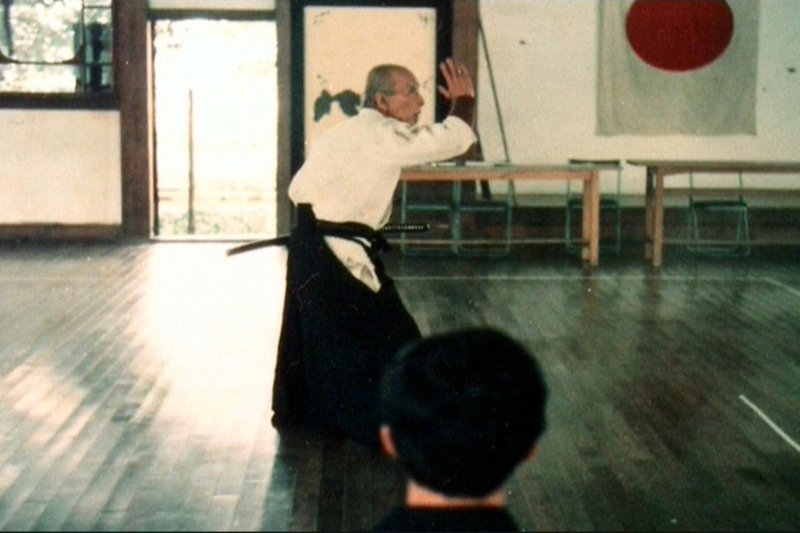 The large majority of the techniques of iai-jutsu, found in traditions born during the second half of the Edo period, were practiced starting from sitting positions, where the movements were extremely restricted.